Featuring a colorful and fresh design indicative of the decade, 1972 Topps Baseball is led by the rookie card for Hall of Fame player Carlton Fisk. The large checklist is bolstered by several new subsets. 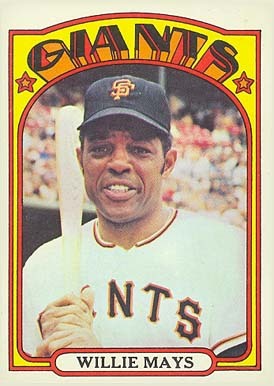 1972 Topps Baseball eclipses the record-setting size of the previous year with a 787-card set. As another release loaded with future Hall of Fame players, the checklist includes multiple rising stars as well as aging veterans. However, the most noticeable thing for collectors is the groovy design. 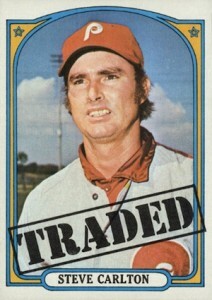 Shop for 1972 Topps Baseball cards on eBay. The 1972 Topps Baseball design includes a wide array of bright colors and psychedelic fonts that make the cards resemble vintage concert posters of the era. Team names are featured in this unconventional style along the top edge of each card, directly above the player's photograph. 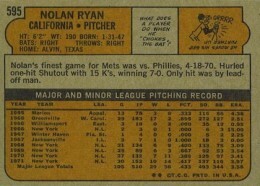 The player's name is housed in an elongated oval at the bottom of the card in very plain text. 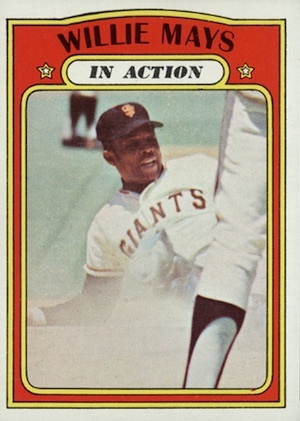 Keeping things simple, Topps opted not to include the fielding position for the players on the fronts of 1972 Topps Baseball cards. 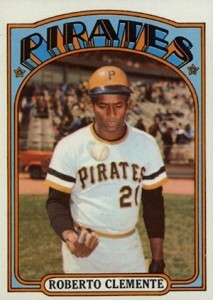 Also gone are the dreaded black borders employed in the 1971 set. Instead, Topps reverted back to white borders. 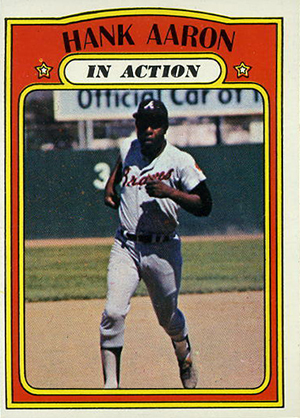 The images used for the '72 offering run the spectrum of in-action shots to posed player portraits. 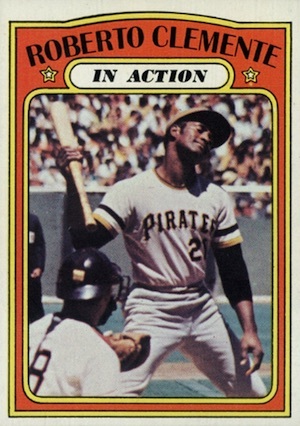 Showcasing a more traditional look, the 1972 Topps Baseball card backs again contain season-by-season statistics after the one-year experiment in 1971 Topps Baseball in which Topps replaced the detailed stats breakdown with a secondary player photo. Cartoons are again found on the backs along with a filled background. The considerable size of the set can be directly attributed to a wide variety of subsets. In addition to the regular options, like League Leaders (#85-96) and Playoffs/World Series Highlights (#221-230), several new themes emerged. 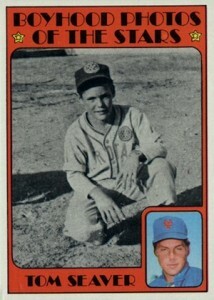 Boyhood Photos Of The Stars (#341-348,#491-498) includes childhood photos and a pre-MLB bio for select players. Awards cards (#621-626) highlight the top trophies in the game and include a full list of winners to that point. Also, the final series includes Traded cards (#751-757) that note a handful of players who switched teams. 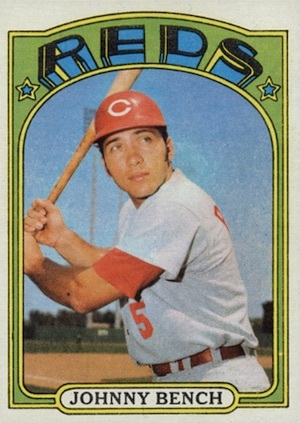 Despite all these subset cards in 1972 Topps Baseball, the most plentiful option is randomly included over the entire checklist. In Action cards follow the base version for multiple players in consecutive order, and to no surprise, feature an action image for the subject. In Action backs combine to form several larger player images. Rounding out the remaining subset cards, Rookie Stars, team cards and checklists are also available in the release. 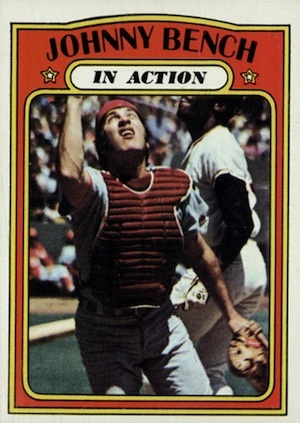 Although Carlton Fisk's multi-player rookie is the clear standout, he is not the only noteworthy player to make his cardboard debut in 1972 Topps Baseball. 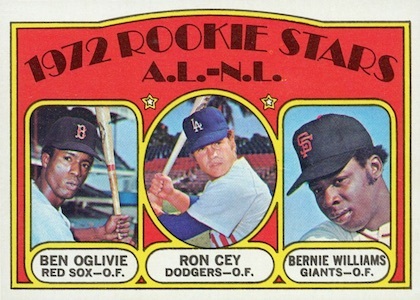 Although less valuable, other key rookie cards include Chris Chambliss (#142), Dave Kingman (#147), Mickey Rivers (#272), and Ron Cey (#761). 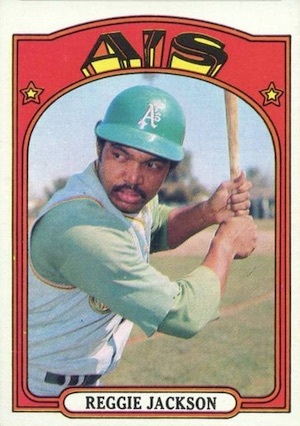 There are only a small number of recognized variations in the 1972 Topps Baseball card set. Four of the variations belong to players from the Chicago Cubs. Base versions of the cards display a yellow coloring for all the letters on the word "CUBS" at the top. Another version that is considerably more rare has been found with green coloring on the letters. The remaining variations are largely aesthetic updates on several of the checklists. Bucking the recent trend of the company, the 1972 offering was printed in just six series instead of seven. However, the high-number cards maintain their scarcity with both Series 5 (#536-656) and the final series of cards (#657-787) proving more difficult to locate. As is to be expected, these cards command a slight premium, particularly for those in high-grade. 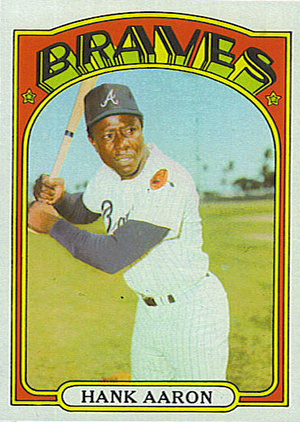 Centering issues are the most notable problem found within 1972 Topps Baseball. This is especially true of the In Action subset cards. Population reports show that while they are not nearly as tough as the 1971 set, several cards within the 1972 release can be quite difficult to find in mint condition. 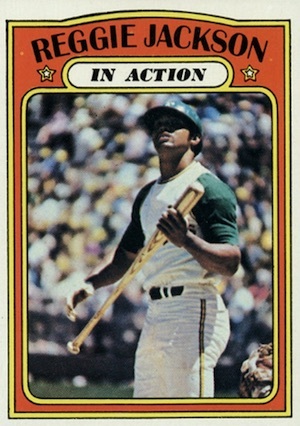 Continuing the Canadian release of the flagship product, the Topps' baseball card set was distributed throughout Canada under the 1972 O-Pee-Chee Baseball brand name. Similar to the previous year, '72 O-Pee-Chee cards include both French and English text. Just the first 525 cards are included in the OPC release. 787 cards. Shop for base sets on eBay. IA=In Action, BP=Boyhood Photos, TR=Traded. Unique design and love the photography. Love the front design, but the back is a bit lacking. 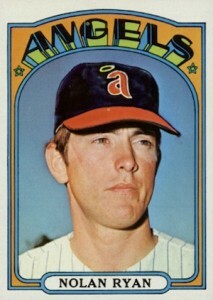 One of the better-looking cards between the late 60s and late 90s. Love the front design, but the back is a bit lacking. 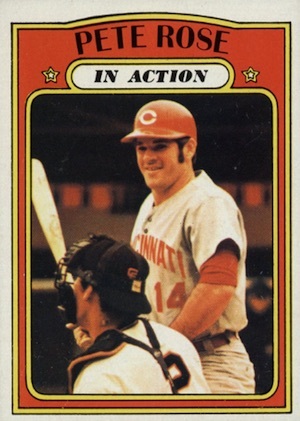 One of the better-looking cards between the late 60s and late 80s. Love this set, but it means more to me since it was the first year I collected. It defines the early 70’s for me. The 1972 Topps set is one of the most interesting sets ever produced by Topps, with all those subsets, in-action cards, Playoffs and World Series cards, boyhood photos of the stars, etc. 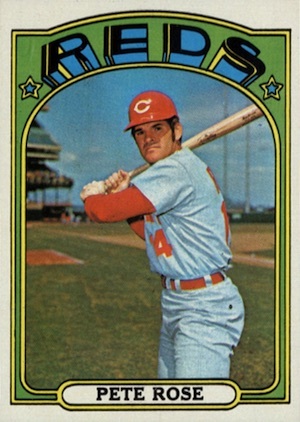 1972 was the first year that I collected baseball cards, and so, it left an impression on me as a kid. 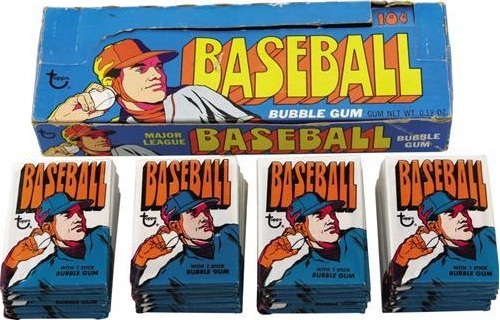 I was able to complete the 1972 set sometime in the 1980’s, when prices were cheaper then. This was one of my favorite sets growing up with it’s wild colors and design. 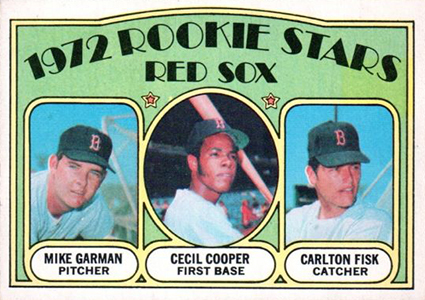 Carlton Fisk is the major rookie card. Boyhood photos was an interesting concept but really didn’t add much to the set.